Although Star Wars Rebels has consistently produced powerful episodes that dive deep into the mythology, the series has also occasionally turned out installments that at first glance seem to be little more than “filler” stories. “Iron Squadron,” this week’s episode, falls into the latter category with a seemingly simple story of three young rebels who’ve taken it upon themselves to continue a family tradition of fighting against the Empire. But what’s often forgotten is the Rebels–like the movies that spawned it–is targeted at kids but also works on multiple levels so discerning adults can find deeper meaning. And since Grand Admiral Thrawn features prominently in “Iron Squadron,” this particular “filler” story is most likely the proverbial calm before the storm and the harbinger of greater (and darker) things to come. Set primarily above the planet Mykapo, “Iron Squadron” opens with the eponymous crew engaged in battle with a small squadron of Imperial fighters just as the Ghost arrives to evacuate rebel sympathizers from the planet. Surprisingly, the Imperials are defeated by the single YT-2400 freighter and retreat and Mart Mattin, the young and prideful captain of the “Iron Squadron” invites the Ghost crew aboard his vessel so the two groups can meet each other. In addition to being based on Lucasfilm staffer Matt Martin, Mattin is the long-lost nephew of Commander Jun Sato and the leader of Phoenix Squadron has pleaded with Hera to bring the boy back to the rebel base on Attolon. But Mattin and his compatriots Gooti Terez and Jonner Jin (based on Rebels Recon and The Star Wars Show host Andi Gutierrez and The Star Wars Show cameraman, editor and producer John Harper, respectively) are not interested in leaving Mykapo and seem to believe their meager efforts will keep the Empire at bay indefinitely. The prideful ignorance of youth is a theme that runs through both the episode and the team of “Iron Squadron,” and it is exemplified perfectly by Mart’s mistaken assertion that he and his shipmates had defeated an Imperial Star Destroyer. But pride is not relegated to youth as Admiral Kassius Konstantine proves. Having risen through the Imperial ranks to prominence, Konstantine has nevertheless failed to impress either Governor Arihnda Pryce or Grand Admiral Thrawn, the latter of which uses the admiral’s pride to goad him into taking a single Imperial light cruiser to Mykapo to secure the planet and stop the rebel evacuation. For Thrawn, everything is an experiment and firmly establishing Konstantine’s limits is a crucial part of his plan to crush the rebellion. On the other side of the spectrum, Ezra shows great growth in “Iron Squadron” as he takes a leadership role in convincing his peers to leave their position over Mykapo and return to Attolon with Phoenix Squadron. It seems that the Padawan has finally learned some of the lessons he’s been taught in earlier episodes as he admonishes Mart, Gooti, and Jonner that the Empire seeks to divide its constituents to prevent rebellion and that how one fights is just as important in what one fights for. And though his words fail to convince Mart initially, Ezra still shows how far he’s come by obeying Hera’s orders to leave him behind when the Sato’s Hammer is crippled by Konstantine’s TIEs. In the final battle between Konstantine and Mart, the theme of pride resurfaces. And while the latter admits his failings in the face of overwhelming odds, the former doubles down on his approach and arrogantly refuses to detonate a mine attached to the Sato’s Hammer until the Ghost is in range as well. But thanks to some thrilling heroics by Chopper and the Iron Squadron’s droid R3-A3, Konstantine’s plan backfires spectacularly and the admiral is humiliated. In the end, Commander Jun Sato makes a rare direct foray into the action to help finish off the Imperial forces over Mykapo and engages in a fascinating conversation with Grand Admiral Thrawn who reveals that he wondered what would motivate Sato’s return to the planet. Though the two leaders have apparently never met, it’s clear that Thrawn possesses intimate knowledge of Sato’s past and now also of his weaknesses. The pieces are being set up slowly on Thrawn’s dejarik table and it is now only a matter of time before the real games begin. Next article The Caffeinated Collector: Episode 30 - That's What Star Wars Means To Me, My Love!! 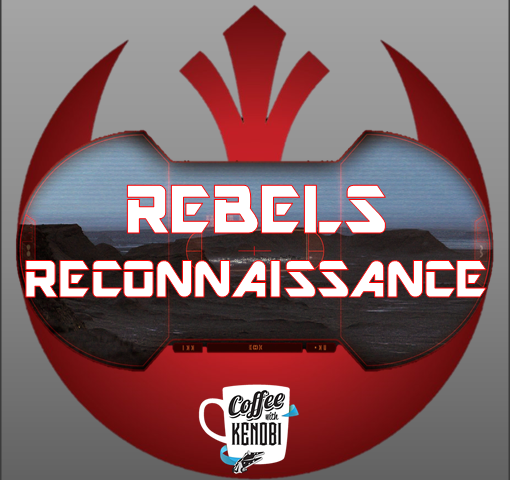 Previous article The Chance Cube - Episode XI: It's Here!! !